In my ideal world, the Internet would be abuzz with photos like the one above, also a school lunch featuring a fish fillet, taken at Samuel J. Green Charter School in New Orleans. One of the first public schools to open in New Orleans post-Katrina, the mission of Samuel J. Green Charter School is to prepare 100 percent of its students for college, careers and a successful life. Central to leading a successful life is living a healthy life, and Green fosters an atmosphere where healthy eating and nutrition education are central to the core curriculum. 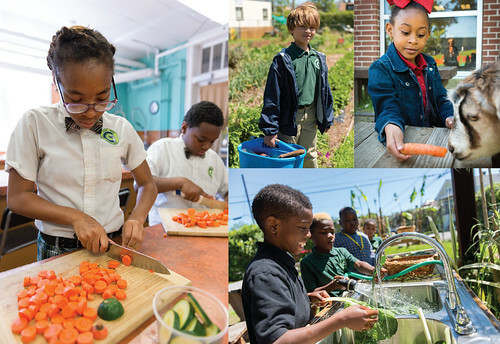 With funding from the USDA Farm to School Grant Program, FirstLine Schools, which operates its signature program, the Edible Schoolyard New Orleans, Green and four other schools in New Orleans set out to make sure that at least five percent of all the foods offered in its cafeterias were sourced locally. With help from Chartwells, a food service management company, FirstLine has exceeded this goal; today, 11 percent of the food that is served comes from nearby farms and food businesses. In the meal pictured above, the rice medley, apple and milk are all from local partners, while the broccoli salad was made on site. On the same day this meal was served – and in fact on every day at Green – kids can have a hands-on experience with agriculture in the school garden. Growing spaces wrap around the school – a butterfly garden, an orchard, live animals, raised beds and compost piles aplenty – all reminders that the food in their cafeteria starts with the small act of planting a seed in the ground or caring for a farm animal. Culinary skills are taught as well, with children routinely cutting and chopping and making their own meals straight from the garden. Is the food at your school fantastic? The garden overflowing with produce? The USDA Farm to School Census indicates that over 40,000 schools, serving 23.5 million students, are buying local foods for the cafeteria and teaching children where their food comes from. So I am certain there’s no end to the great photos we could share with one another. Post a photo of what your school is doing on Twitter, Instagram, Vine, Facebook or Tumblr using #farmtoschool or #realschoolfood. “This is what they serve for lunch?” parents will exclaim, amazed that school lunch can be so nourishing, so local and so good. To learn more about the USDA Farm to School Program, sign-up for the Farm to School E-letter. 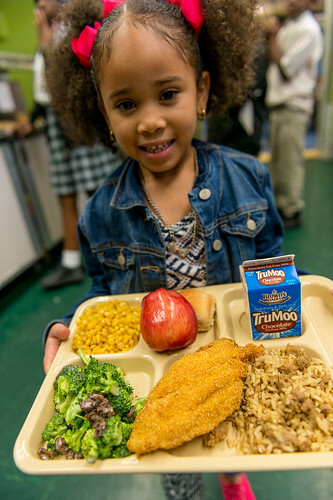 The first photo captioned "Beautiful meals like this are what’s for lunch today and every day in schools across the country." is one big complete LIE at an attempt to counter the hundreds of photos posted to Twitter and Facebook of the processed, rotten, and nutritionally void food being served in America's cafeterias. Fried fish(which seems to be two pieces stacked), large helpings of rice, broccoli, and corn, in addition to an apple, a roll, and a carton of milk.How does a 5-7 year old, who is holding the tray, eat that much food in one sitting? The answer is they don't, and it wouldn't be physically possible for a child her size to eat that food. Just comparing the size of her hands to the fish fillet is comical. Illusions of abundance do not make for a good PR campaign. This photo does not represent the food people are critical of, or even a typical meal (if director thinks the photos are dramatic) and does nothing but reinforce the points your critics are making. Instead of taking offense at the photos of unsavory food, you should take it as constructive criticism and admit the failure of Federally Regulated lunch programs. Drastically change the course of the program or shut it down. This only hurts the children eating the food. That meal does not look anything like what our children get at school! As you notice this is a unique situation. If you want to make things better, have all schools do this. I wish our school lunches looked like the PR picture. I have taught for about 28 years at our local high school. The food has gone from OK to awful.I have never seen so much food wasted. Kids and adults say cardboard would taste better. The lack of flavor is not the local workers fault. They have to go by federal regulations. I would like to see the people who came up with these standards eat this food everyday. I bet they would do what I do. Brown bag their lunch. Your school lunch photo looks really good be do you really expect anyone to believe that little girl is going to eat everything on her plate. That's enough food for her and a couple of her classmates. It's more than most adults would eat for dinner. I realize that most school lunches probably aren't nearly as scary as some of the ones that get posted on FB but you've gone to the other extreme with this photo. If you think that is what most school lunches look like you are not visiting poor schools...our lunch program consists of individually wrapped JUNK - a bun getting soggy in a plastic wrapped bag.....wilted green lettuce and 1 grape sized tomato in a plastic wrapper - 1 chicken or beef patty in a plastic bag covered in moisture - a fruit cup in syrup - and milk. It looks like crap....I wouldn't eat it! Hell the pizza every friday is in plastic wrap with gathers moisture so it is soggy, the cheese doesn't fully melt properly, and most of the meals are burritos, beans, cheese dippers, pizza dippers, pizza, hamburgers and hot dogs. All of it is CRAP - nasty looking, nasty smelling and I wouldn't feed it to a dog let alone a child. Make school lunches soup, salad, fruit fruit, sandwiches and milk...and kids will eat it and they will be healthier...its a win win! Who do you people think you are trying to fool? I have a child in school and that is no where close to what or the amount that they are served. He comes home hungry most days. You must think we are stupid. I find this phrase very problematic : "“This is what they serve for lunch?” parents will exclaim, amazed that school lunch can be so nourishing, so local and so good. " I think that if schools serve healthy food, parents will be happy, but they shouldn't be "amazed". It's not a 'miracle'. It's TO BE EXPECTED. The point of view seems very odd here. Fundamentally, why would a person be "amazed" that school lunch is either good, local, or nourishing? For a school lunch to be nourishing and good - is that something worthy of amazement? If it is. That's a problem for me. Also I believe that the 1st commenter hit the nail on the head. I would personally say that the image is #1- photoshopped and, frankly, practically on the level of cold war 'soviet' propaganda, and #2 - that is way too much food for a child that age. Of the supposed "#realschoolfood tweets" half still don't provide enough calories and/or are way too heavy on starches. The rest are an illustration of what only privileged children get to eat at school lunch. Frankly, some of the pictures that supposed to be positive I find scary. I do not understand why people in the United States starve their children of nutrients. Children, especially young ones, should NOT be drinking low or no-fat milk. Fat calories from good sources (not vegetable oils) are important for brain health and satiety. I think what we choose to serve to children in schools today is what we will be eating in assisted living and retirement homes tomorrow. I remember eating food like that shown in this PR picture when I was in elementary school twenty years ago. The quality declined dramatically when I started high school, and it was far, far worse from what is shown here. It would have been great to eat something as halfway appetizing as the food shown. I think you all need to take a closer look at reviewing the nutritional standards; it's apparent from the #thanksmichelleobama hashtag that there's a real problem with school lunches. Unfortunately, the answer to your question "Is this what they serve for lunch!?" is yes. As I can personally attest, the food in many school districts really is awful. Please don't pretend it isn't, even if there are some districts that are actually doing a good job. "in the digital age we have ample opportunity to document and broadcast every moment, meeting and meal"
I have never seen a school lunch that looks like that ever since the new laws were passed by Michelle Obama (pretty sure the old lunches were more appetizing). Michelle Obama's new standards are so hypocritical; we can no longer purchase Chick Fil A biscuits on Fridays but we can purchased processed fried chicken sandwiches drenched in hot sause? How is that healthy. We can no longer purchase cookies from the school store, but the cafeteria can sell them as a side item? All I can tell you is: Nice try but, you are not fooling anyone. My child takes her lunch that we make for her everyday because the school food is disgusting and insulting. The first day I showed up to eat lunch with my daughter, her teacher asked "Oh, you didn't bring your lunch? You don't want to eat from the cafeteria." You can doctor all the surveys in world but, you can't alter the truth. Why is it the menu picture never looks like the food that ends up on your plate? He thats what this reminds me of. A pack of lies..
What schools have food that looks like this? My child's school serves bologna sandwiches and that serves as their source of protein?!!! !